The retina is the delicate inner lining of the eye that reacts to light through a chemical process that sends nerve impulses directly to the brain. It is only about 1mm thick and has the consistency of wet tissue paper. Because of its delicate structure, it is vulnerable to breaks that can cause the retinal layers to become detached from each other. Some people are predisposed, by heredity, to have retinal tears and holes. Early detection and treatment of tears or holes can help prevent blindness or severe damage to vision. 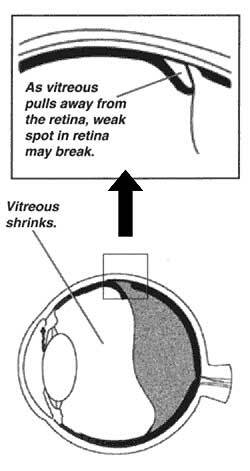 As part of the aging process, the vitreous can shrink and pull away from the retina. Although the vitreous is only loosely attached to the retina, as it pulls away a tear may occur at a weak spot in the retina. Degeneration of the retinal tissue over time can also cause tears and holes to develop. These tears and holes usually occur in the peripheral retina where there is little effect on vision. However, they can lead to retinal detachment in some cases, so it is very important to see a doctor if you notice signs or symptoms of retinal tears or holes. Retinal tears and holes may not cause visual symptoms. However, they my show symptoms such as sudden flashes of light, floaters, smoke or cobwebs, or as if someone has thrown a handful of dirt in your eyes. If any of these signs occur, you should be examined by an ophthalmologist to determine if a tear, hole, or detachment has occurred. Treatment options include cryotherapy and laser treatment.